Churches remain at the heart of offering help to homeless people at Christmas, according to the latest report by Housing Justice, with numbers doubling on the previous year recorded. Churches remain at the heart of offering help to homeless people at Christmas, according to latest report by National Christian Charity, with numbers doubling on the previous year recorded. Nearly 2,000 people were welcomed into church and community based Winter Night Shelters across England and Wales in 2015, according to a new report, published this week by national Christian homeless charity Housing Justice. In its fourth year of reporting activity, the Housing Justice Night Shelter Impact Report demonstrates the vital contribution made by churches and faith communities when it comes to Night Shelters and the guests they faithfully serve. A study of Church and Community Night Shelters shows homeless guests were accommodated in over 500 venues last winter with more expected to be accommodated in this current season. A total of 1920 guests visited the night shelters during the season, a slight reduction in the number of the previous year of 2171, with anecdotal evidence that this is partially because some guests are staying for longer. In the report, it also shows volunteers gave 490,063 hours of volunteer time to Church and Community Night Shelters; an average of 14,850 hours per shelter. This is an increase on the previous year of more than 112% on the previous year. The estimated value of the time according to these figures is £6174,805, based on ONS average earnings figures. Whilst regretful of the need for Night Shelters, Housing Justice is seeking to give thanks for the work of thousands of volunteers across the country. Encouraging churches to set up more Winter Night Shelters in their own area, the Bishop of Edmonton, the Rt Revd Rob Wickham has been invited to become the first Housing Justice Night Shelter Ambassador. As part of his new role, the Bishop of Edmonton, the Rt Revd Rob Wickham, will be joining local volunteers at the Night Shelter based at St Dionis Church in Parson’s Green in the Diocese of London this evening. During the visit, Bishop Rob will meet with trustees and staff from Glassdoor, London’s largest emergency winter night shelter, who partner with St Dionis to run its Night Shelter. The St Dionis shelter provides life-sustaining food and shelter between November and March each year. Volunteers and partners work closely to provide dignity-restoring support to help men and women find solutions to their homelessness. “This report highlights the continuing and growing need for Night Shelters. While this fact is no cause for celebration – rather the opposite – it is very good that an increasing number of Shelters have sought the Housing Justice Quality Mark over the last 12 months. The Night Shelters team at Housing Justice supports and equips local faith communities across England and Wales to offer the highest possible quality of provision. The team looks forward to awarding the Quality Mark to more projects in the coming months. Each Night Shelter is an expression of God’s love in action, providing dignity for the most vulnerable in our communities. I am deeply grateful to all those volunteers who give of themselves so willingly through the work of the Shelters. They work unsociable hours, offering food, shelter and other practical care; they embody love for neighbour and generosity of heart. The shelters typically run between November and March and involve a circuit of churches, community groups and places of worship of different faiths and denominations, each taking a designated night of the week to provide shelter on their premises to between 12 and 35 guests. Each shelter provides an evening meal and a bed for the night, and breakfast in the morning. “This year Housing Justice Night Shelter Impact Report shows the excellent work that Christians across the whole of England and Wales are doing to support those who are in great need this Christmas from homeless. This new report shows that, whilst there has been a drop in the number of guests being hosted by churches in this last shelter season, there will certainly be a significant increase in this current season. 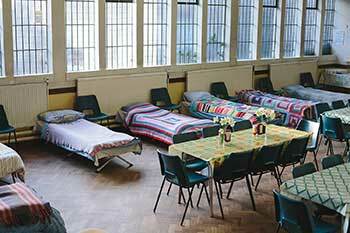 Photo above: Hackney Winter Night Shelter. Photo: Paul Driver.